Special Containment Procedures: As SCP-1556 avoids human contact and currently roams an area greater than 15 km from any human settlement or roadway, containment procedures require only that the herd be monitored and tracked. Ground personnel tracking SCP-1556 must maintain a distance of at least 200 m at all times, and must not openly carry any weapons as this may trigger a defensive response. Experiments involving the tranquilization of individual SCP-1556 specimens have been suspended indefinitely. Description: SCP-1556 is a herd of sixteen (16) fifteen (15) free-roaming feral Mustang horses inhabiting a mountainous region approximately 135 km southwest of [REDACTED] in the United States, consisting of one (1) lead stallion, eight (8) seven (7) mares, and seven (7) juveniles. SCP-1556 has only been observed during periods of mist or fog that reduces visibility to below 100 m, and individual specimens are recognizable by their unusual behavior and reflective amber eyes (implying the presence of tapetum lucidum). 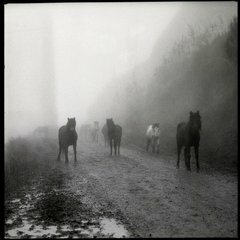 During periods where there is insufficient mist for SCP-1556 to be observed, no trace of the herd can be found; tracks made by SCP-1556 individuals simply dead-end without explanation. Over █ years of continual observation, it has been determined that SCP-1556 roams in a lemniscate pattern extending approximately 87 km from [REDACTED] to [REDACTED] at a rate of approximately 1.1 km per day. The reason for this specific pattern of movement is not known, but does not seem to correspond to any local meteorological conditions or the movements of any other local animal species. SCP-1556 exhibits greater strength and endurance than is normal for feral horses, as well as a higher level of intelligence; SCP-1556 has been observed exhibiting behavior such as mutual grooming, problem-solving, and coordination that is highly unusual for equine species. SCP-1556 also exhibits extraordinary resistance to adverse weather conditions and the effects of high altitude, and has been observed on mountaintops or during periods in which extreme low temperatures would prove harmful to normal horses. On █/██/██, oversight approval was granted to attempt to tranquilize SCP-1556-3, the lead mare, for field examination and tagging. Shortly after being struck by a tranquilizer dart fired by Foundation field researchers, SCP-1556-3 went into convulsions and collapsed. It is not known at this time whether SCP-1556-3 was allergic to the tranquilizer or whether the dosage was greatly overestimated, but the remaining individuals of SCP-1556 became highly aggressive, attacking any personnel wielding a firearm or attempting to approach the body of SCP-1556-3. All personnel were ordered to retreat to a safe distance to treat injuries and observe the herd. The body of SCP-1556-3 was never recovered; it disappeared along with the rest of the herd upon dissipation of local mist conditions and SCP-1556-3 has not been observed since. Since this incident, SCP-1556 has avoided human contact and makes aggressive movements towards any personnel approaching the herd. Further experimentation has been suspended until further notice.